Picture Book Theology: Favorite PBT Posts: The 1st Crayon Book! Crayons are something special for adults! Like picture books, they tap into feelings of nostalgia or a simpler time. A big box of 64 is a metaphor for the breadth of creativity and possibility that I wish I hadn't left behind in childhood. The author/illustrator duo, whose books are featured below and on Monday, offer a new (and clever) way to think about crayons. This is one of my favorite PBT posts and very timely given the Times Up Movement! The book's sequel will be re-posted next time. Enjoy! Summary: When Duncan pulls out his crayons at school, he finds a stack of letters instead. The red crayon is working too hard, not even getting off for Christmas! The white crayon is used mainly on white paper so it feels misused and empty. The black crayon is only used to draw the outline of things. It’s not fair! The pink crayon hasn’t been used once! You can guess why. After all the letters are read, Duncan turns in a new piece of art that is very different from his usual productions. The result is unique and praised by the teacher. Clearly the crayons have been heard and change is the result. Hanna’s Comments: Immediately, I saw 2 ways this clever book can be connected to scripture. I'm sure there are others. My first reaction was to focus on the tone of these letters. The Psalms are full of complaints, called lamentations. A lesson on this kind of prayer can be very eye-opening for children and adults. The fun of the crayons balances the negative emotions you are exploring. Secondly, I thought about the biblical prophets and the phrase “speaking truth to power.” Sometimes the right words to the right people can bring forth positive change with regards to injustice, neglect, or inefficient systems. That’s what happens in this book and that's what drives positive change, like justice movements. Justice is one of the priorities of most religions in the world. Keep in mind that there is a lot of text in this book. I suggest reading a few crayons' letters per sitting if your children are easily distracted. You could do a whole series of lessons or a week of arts camp with the ideas in this book and its sequel. 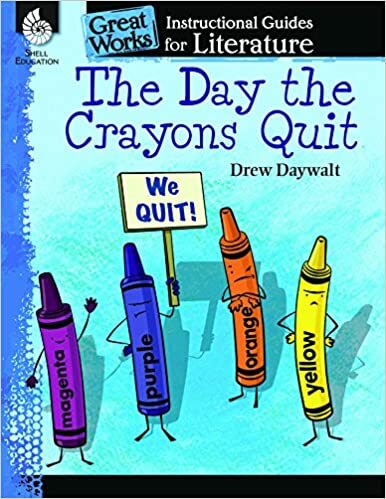 The new book is about a different group of crayons that Duncan abandoned. They want him to rescue them. Sounds pretty biblical too! It’s called The Day the Crayons Came Home. Comment added later: Since the great popularity of this series, there are several products that you can purchase. This one really peaked my interest. Idea(s) for Application: Read this fun book and it's sequel to a group of children, teens, or adults in lessons on psalms of complaint or speaking truth to power when doing justice.